Lorenzo Fertitta said he has not spoken to anyone at UNLV regarding a financial commitment to the school’s football program. Lorenzo Fertitta, CEO of Ultimate Fighting Championship and vice chairman of Station Casinos, said he has not spoken to anyone at UNLV regarding a financial commitment to the school’s football program. Rumors have swirled the Rebels would hire Bishop Gorman High School coach Tony Sanchez to be their head coach with the financial backing from the Fertitta family. UNLV is looking to replace coach Bobby Hauck, who resigned after five seasons with a 15-49 record. BOYKO GETS INVITE — Rebels offensive tackle/guard Brett Boyko was invited to the East-West Shrine Game on Jan. 17 in St. Petersburg, Fla. 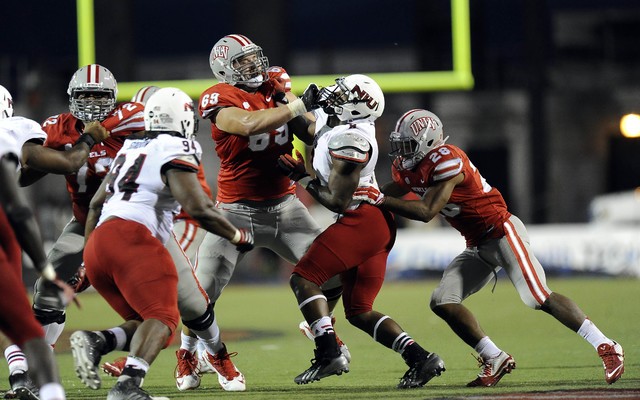 He is the first UNLV offensive lineman chosen to play in East-West game and the first in any all-star game since center Joe Hawley participated in the Texas vs. Nation game in 2009. Hawley plays for the Atlanta Falcons. In addition to being a potential NFL Draft pick, Boyko is rated the No. 1 prospect for the Canadian Football League. CONFERENCE DISCIPLINE — The Mountain West reprimanded UNLV defensive end Josh Shirley for making “inappropriate contact” with a UNR player on the Wolf Pack’s bench in the fourth quarter of Saturday’s 49-27 loss by the Rebels. That was not the only action taken by the league. The Mountain West also reprimanded Wolf Pack coach Brian Polian for criticizing the officials. Polian was upset UNR was penalized 11 times compared to three for UNLV.